For the better part of our 10-year relationship, my partner, Dan, has talked about going on a gay cruise. I resisted at every mention, worried that it would be too loud, too crazy and too impossible to find just one good night's sleep. Little did I know, I wouldn't want one. Out of the kindness of my heart, I finally relented. We decided on Atlantis' party-heavy Independence of the Seas cruise in the Caribbean, Feb. 2-10. Why not dive in head-first, we thought. The schedule was a day longer than most of their cruises in the past. Friends of mine told me I'd be very ready for it to be over by the last day. They couldn't have been further from the truth. 1. Less is More The first thing we noticed on board the ship: Wow, did we over-pack! And we only brought one suitcase! 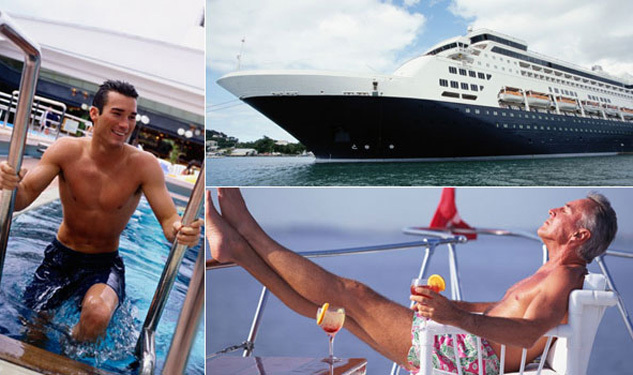 All we ultimately needed was the clothes we walked onto the ship wearing and a handbag with a dozen speedos. We would have fit in perfectly. 2. Costume Parties Are a Must Before we left, Dan pooh-poohed the themed dance parties as a hassle, having to plan for a half-dozen 'outfits.' They ended up being a highlight of the trip. It was inspiring to see some of the outfits people dreamt up — umbrellas-turned-jellyfish for the "Under The Sea Party" and bald eagles for the penultimate 'White Party.' And the costumes added an ice breaker that kept the mood fun and light. Though, staying with my lesson on packing, most guys just wore a "festive" speedo or underwear — camouflage for the "Dog Tag Party" or sparkly silver for the "Disco Party" ? and nobody was complaining.